The Himalayan Wolf is a subspecies of the Gray Wolf. This is a fairly new species to have been identified. Thanks to genetic testing we now know it is very different from the closely related Indian Wolf. They are light tan in color and have gray to them as well. Many of them have white or black around the face and along the chest. This particular species of wolf is found in some specific areas of India. They include Jammu, Kashmir, Nepal, and the Himalayas. They have been identified in both China and Mongolia. When they were originally named it was believed that they only lived in the Himalayas. It wasn’t until much later when packs of them were found to live in these other regions as well. Due to the smaller number of Himalayan Wolves, they tend to have smaller packs. They may only have six or eight members. They have a decent size of territory that they cover, it can be several hundred miles long. They don’t seem to be as aggressive when it comes to protecting such territory though. In fact, there are many packs of Himalayan Wolves that also have Indian Wolves overlapping them. Yet the two don’t seem to be bothered very much by the other. While some confrontations do exist, it is generally only going to take some howling and growling to get one part to be on its way. Rarely do these species of wolves have a physical level of confrontation. The diet for these wolves is mainly small and medium sizes animals. Rodents and rabbits make up the majority of what they will consume. Sometimes they will take down the young of larger sized prey because they do need to take advantage of every opportunity out there to feed that they can. They are skilled hunters and know it can be hard to find their next meal. These wolves are considered to be mature about two years of age. That is why many of them leave the pack when they are about 1 ½ years of age. They want to be able to establish a territory and to find a mate before the breeding season. Generally the females will have four or six pups. She will take very good care of them in a den for the first couple of months. Then they will join the rest of the pack. 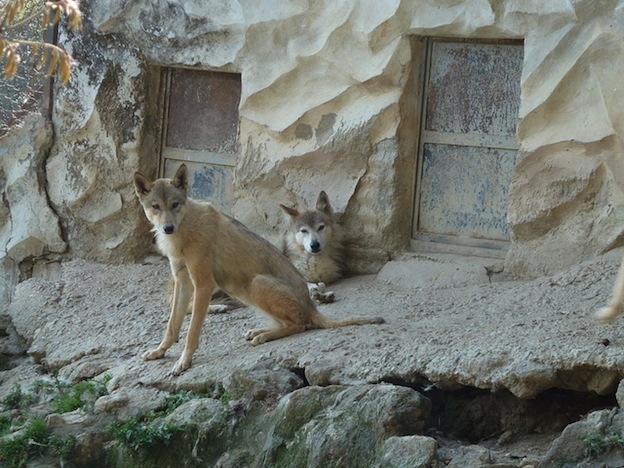 Due to the fact that the Himalayan Wolves live so close to the Indian Wolves, many experts anticipated that they would engage in some cross breeding. However, to date there is no evidence to suggest that this has actually occurred. Perhaps some evidence of that will be found in the future. Today there are less than 350 Himalayan Wolves left in the wild. There are also 21 of them that live in zoos around India. With such a low population it is very hard to increase their numbers. Yet many that have a passion for them aren’t willing to give up on them. Instead they continue to do all they can to ensure these animals have a place to live and access to food. This is a very difficult task though and one that needs a great deal of support in order to be successful. Part of the success of helping them to survive involves breeding programs that take place in captivity around India. These young pups are being raised to help increase the numbers. The goal is to one day be able to release many of them back into the wild. There are plenty of farmers and ranchers in these areas that are happy to see the low numbers of the Himalayan Wolves. They continue to see their animals being taken as food by them. There seems to be no love lost at all when it comes to these wolves and humans.